By now several other people were involved in the chase. Before anyone could grab the dog it jumped into the water, Atz said. Fairfax resident Patrick O’Brien, who had been in the area buying lumber, saw the commotion and got involved. “This dog was tearing down the street and then jumped into the water,” said O’Brien, a photographer. 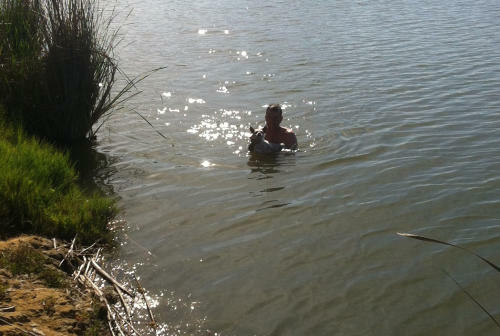 “It just kept swimming and swimming and these geese started coming in and who knows what they were going to do to it.” Fearing the dog would drown, O’Brien, 49, took off his shirt and shorts and jumped into the cold water to get the dog. It was decided to take the pooch to the nearby Marin Humane Society, but before that could happen the dog’s owner arrived. She told the rescuers she had adopted the dog three days prior and it had slipped its collar while out for a walk, O’Brien said. Nat is the Founder and Editor in Chief of Uncoached Corporation and all its properties. His primary roles are managing editorial, business development, content development, online acquisitions, and operations.Uncoached began in 2007 with one site and a goal of creating content that was clear, concise, worth reading, entertaining, and useful. Since then the portfolio has grown to 8 properties covering a wide array of verticals including business, personal finance, real estate, architecture, television, movies, entertainment, video games, lifestyle, pets, and more.